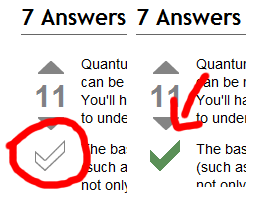 Someone commented to me: "please do not forget to update and accept answers" but I can't figure out where or how to do this. What should I do if none of the answers is suitable? Wait a few days after asking it, and then edit your question with what you've learned since asking it — perhaps additional information will help others help you. This will also have the effect of bringing your question back onto the home page where fresh eyes will see it. If you have more than 75 reputation, you can add a bounty two days after the question is asked if you haven't accepted any answers yet. This will add incentive for people to answer your question. Internal struggles: Which answer to accept? I need to accept an answer, but whose? How does the accept answer on Stack Overflow work? Is it good to accept answers which actually give alternatives instead of answers?